Syma X5C-1 Drone Review 2019 – is the Syma X5C-1 quadcopter worth the money? Review of features, pricing, flight duration, battery, camera and more. X5C has a high degree camera and a unique look, Easy to use. Syma X5C-1 Drone is an amazing quadcopter that has got an excellent flight performance. This affordable toy-guard is affordable and is perfect for any amateur who’s looking to learn. 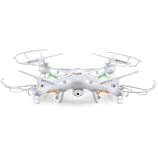 Considering how small it is, this quadcopter is easy to handle, and you get to learn much faster. This drone trainers can take several falls due to its durable exteriors. The 2 MP camera captures impressive pictures and videos that get recorded directly to the SD card. Syma X5C-1 packs everything you need in a quadcopter at an affordable price. Syma X5C-1 Drone is an upgrade of the X5C-1 model that was released back in 2013. It has its predecessor’s stability, affordability and ease of use. The use of technology to design this quadcopter adds tremendous value to the already fantastic drone trainer. It’s a sub-$100 that can flip and roll as well as take decent photos. Toy-guard quadcopters are reliable, and Syma X5C-1 Drone is a classic example. This quadcopter is fun to fly as it can flip and roll. It is much quieter and has a smooth flight. The enclosed battery compartment ensures that the batteries don’t fall out as you fly it. 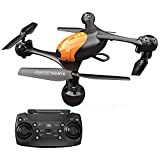 This beginner trainer drone suits beginners, and it helps you to refresh your skills even as an intermediate drone flyer. The user manual is in English, and it includes all the information you might need. This quadcopter toy-guard is very stable in the air, enabling beginners to learn how to fly a drone quickly. It easily hovers, and the controls are easy to reach so that the person flying it can handle it without any problem. The bright LED lights are convenient when you are flying indoors or even outside on a cloudy day. The bright lighting adds orientation, further easing the learning process for beginners. Without the prop guards, you get 6-8 flight time from this quadcopter, whereas when you are flying and shooting a video at the same time, flight time reduces to 4-5 minutes. If you use batteries with larger capacity, it is possible to extend this quadcopter’s flight time by one or two minutes. Nano-Tech Turnigy 750mAh 35C batteries significantly boost the flight time of this quadcopter. Remember to reverse the polarity of your connector when using these batteries. Otherwise, the circuit board will sustain permanent damage. This quadcopter has to speed mode; low and high. For beginners, it is advisable, to begin with, the low-speed mode before advancing to the high-speed mode. The low-speed mode is convenient for tight indoor spaces because you can control it more easily. If you are well vast with how the quadcopter operates, you can add excitement to your fun flying by going for the high-speed mode. You can as well toggle between the two modes and find the perfect balance. This can be done by using the button on the upper left side of the quadcopter’s transmitter. You can also make the quadcopter flip and roll by moving the right stick in the direction you want the quadcopter to flit. The Syma X5C-1 Drone comes with a 2 MP HD 720P camera that takes decent pictures and videos. Packed with a 4 GB microSD card, you have enough storage space to have all your videos and photos. 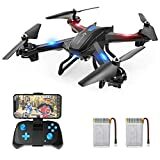 However, if you need more space, you can connect this drone to your laptop and transfer files from the microSD card. For a sub-$100 drone, this quadcopter packs pretty amazing features. You get to have an ariel view of as you explore the indoors and outdoors with this drone’s camera. You are required to purchase four AA batteries to get the transmitter powered. With a 50m control range, you can explore a wide range with this drone. The range can be extended by consulting with a tech professional. Being an upgraded version of the Syma X5C, Syma X5C-1 Drone is more or less the same as its predecessor. The flight and performance as the same, the same technology were used in designing it. An observable difference is its smaller size which saves you money during on shipping. This device is beginner friendly and stable in the air. With the low-speed mode, you can control the drone’s movement as a beginner. It comes with anti-corrosion protection and is very durable. This is an excellent choice for anyone looking to have a good time flying a drone. This quadcopter is stable and fun to fly. 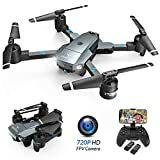 It is an excellent trainer drone for beginners. Its durability allows it to take several falls without being damaged. The 2 MP camera captures decent images and videos.